"If I like it, I keep it." 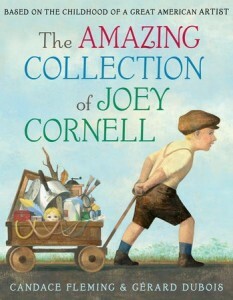 At the turn of the 20th C., Joey Cornell was a young boy with an eye for things he loved and a penchant for collecting. A doll's head, a soap bubble pipe, an old pan all were assembled in a pile while Joey enjoyed their possibilities, what they had to say to each other and naturally found ways of putting things together to create connection and art. "It's not what you look at, it's what you see, " the grown up Cornell would go on to say. His family teased him on one hand and encouraged him on the other. When his father passes away, the family mourns and Joey searches for a way to bring "happy" back to their world and that's when he discovers his gift. One of America's foremost 20th C. artists, Joey Cornell's collections pique the imagination and open doors into the possibilities of beauty in the ordinary objects that watch over us each and every day. This is a beautiful testimony to the birth of a voice in a family that allowed it to grow. Cornell beat to his own drum and brought his vision forth to make our world a better place. Wonderful read aloud for children who are wondering how a "voice" is discovered and nourished. Award-winning and bestselling author Candace Fleming delivers a stunning picture-book based on the childhood of artist and sculptor Joseph Cornell, sure to beguile aspiring artists and collectors of all ages. Joey Cornell collected everything -- anything that sparked his imagination or delighted his eye. His collection grew and grew until he realized that certain pieces just looked right together. He assembled his doodads to create wonderful, magical creations out of once ordinary objects. Perfect for introducing art to kids, here's an imaginative and engaging book based on the childhood of great American artist Joseph Cornell, told by master picture book author Candace Fleming and lauded illustrator Gérard DuBois.